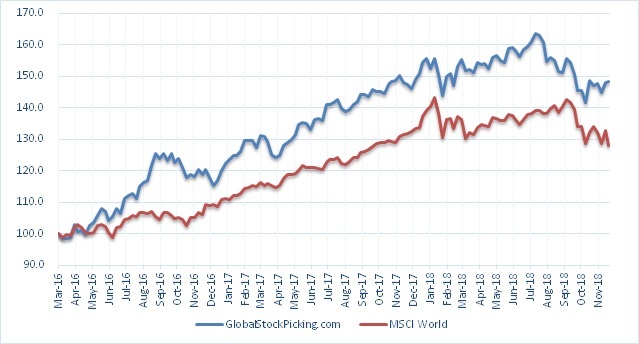 The third quarter of the year has passed and the bull market is still roaring pretty strong. My guess a few years ago would have been that we should have seen a larger setback by now. On this particular point I feel pretty humbled by being wrong for so long. Performance wise I do not feel as humble. 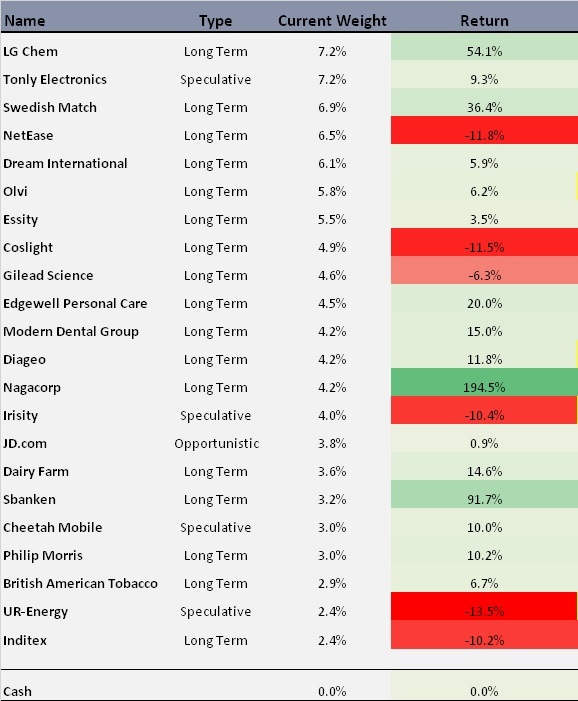 I have done quite a number of things wrong during this year, mainly selling stocks too early. But in general I did more things right than wrong and that’s what counts. Let’s go through the performance and some high- and lowlights. 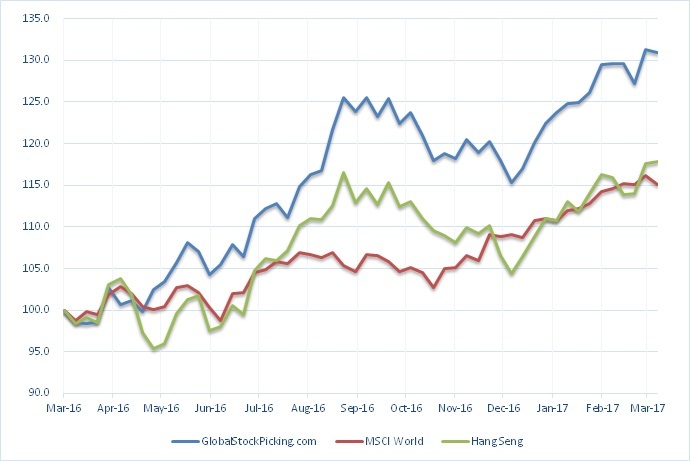 Year to date the Global Stock Picking portfolio is up +24.5%, that compares favorably to MSCI World (Total Return) which is up +17.4%, but lagging Hang Seng (Total Return) which is up an incredible +29.3%. 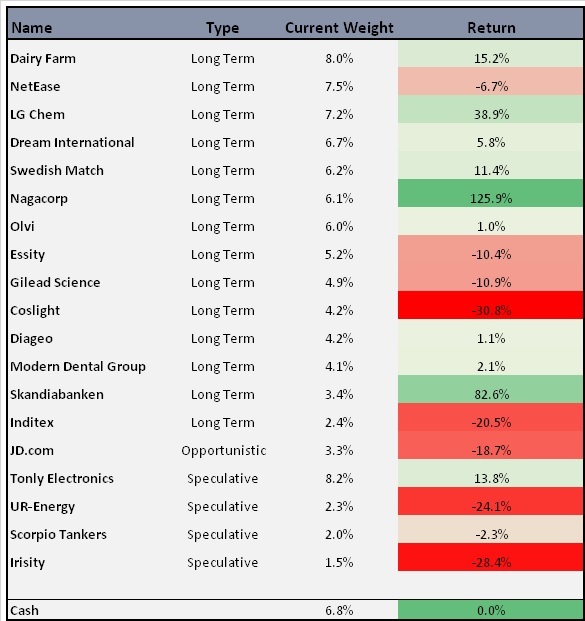 Looking at risk adjusted returns, I’m not faring that well though. 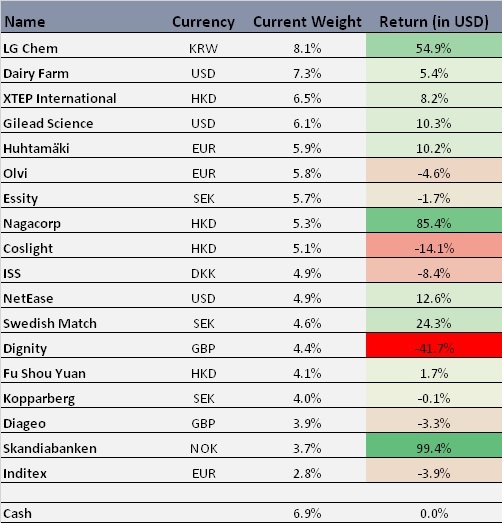 Although I have run a large cash position (which lowers volatility) the volatility YTD is at 10.5%, compared to MSCI World at 5.5% and Hang Seng at 11%. 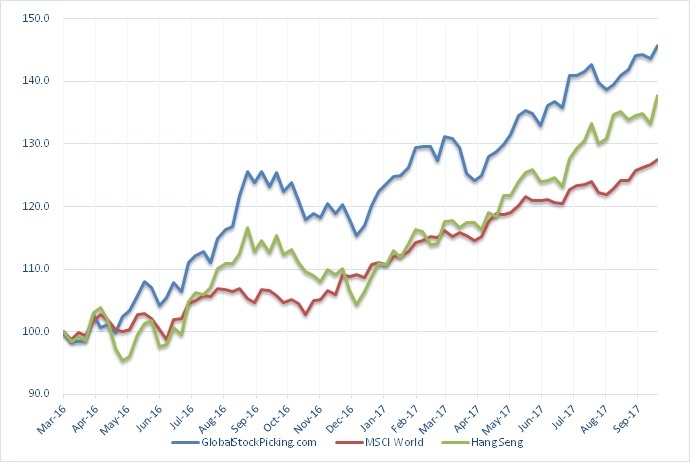 So risk adjusted I come out with the worst Sharpe ratio of 2.33 vs 2.66 for Hang Seng and 3.17 for MSCI World. I guess that also says something about the state of things in the markets when a Global Index portfolio is returning a Sharpe >3. I probably sound like a broken record soon, but this to me is a very late stage bull market and one should plan accordingly. I did make an attempt to discuss the topic recently (Where to hide – a factor approach). 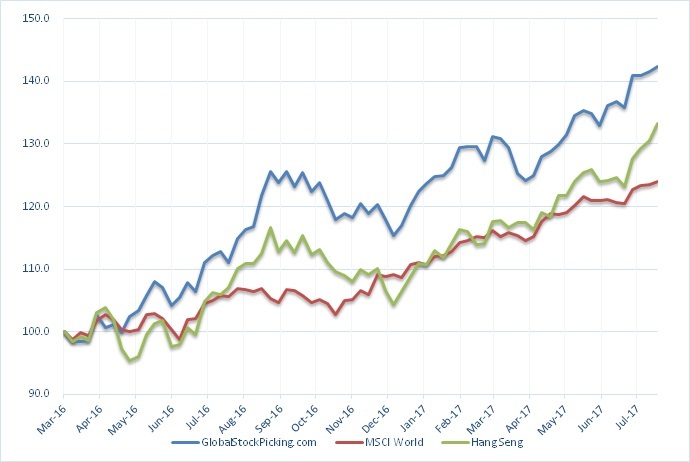 That I have added Hang Seng as a comparison might be somewhat misleading, since my intention is to run a Global portfolio. 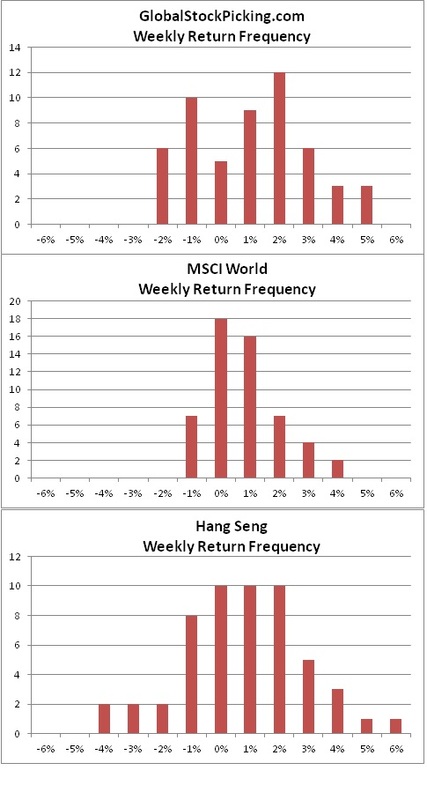 The reason why I added Hang Seng was due to my heavy China tilt when I started the blog. I would argue that is not a constant tilt that I will have over time. It was an allocation call I made at the time. 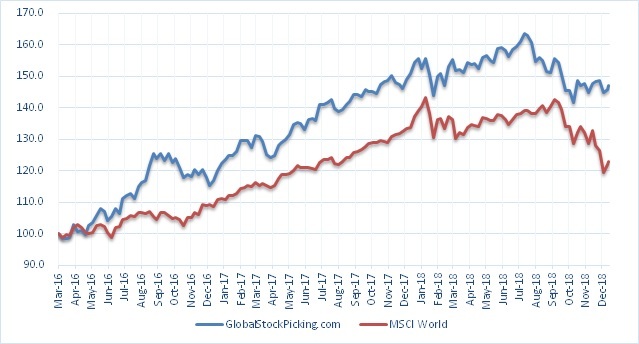 It is a call I’m obviously happy about, since it has given me free Beta out-performance against MSCI World, which is my true benchmark. Lately I worry about the Chinese economy and the valuations has got more stretched also for Chinese stocks. As you know from previous posts I actively rotated away from China. 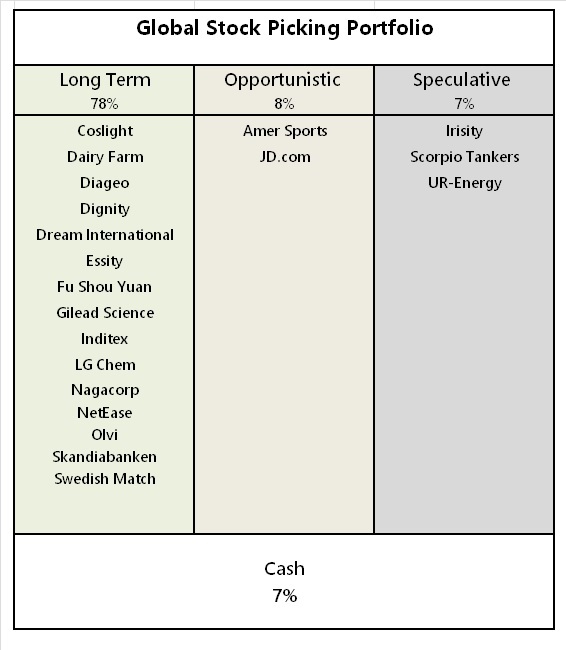 Currently my portfolio has 16.5% of its cash invested in companies with most of its earnings from China (Coslight, XTEP and NetEase). 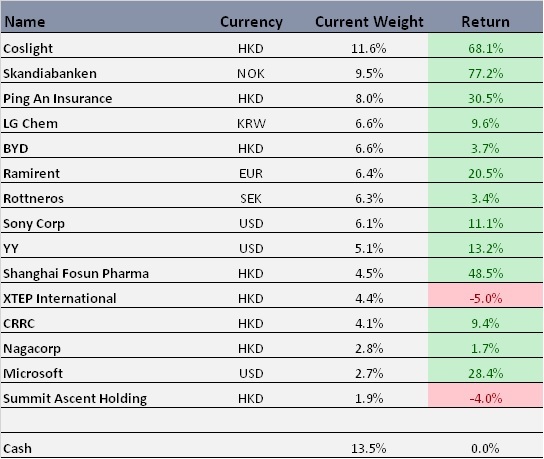 I will keep the Hang Seng comparison for sometime, but I might remove it at some point. Buying Gilead became a very well timed investment. The market really liked the new product line their are buying themselves into through their acquisition of Kite Pharma. I honestly don’t have the knowledge to know if this will actually be so fruitful as the market seems to think. My impression is that (the market thinks) Gilead has a strong acquisition track record. Nagacorp which we discussed extensively in the comments and I choose to double up on has come back to something closer to fair value. The company continues to execute well on attracting more VIP players and the Naga2 complex is about to open in full scale. Next Chinese New Year will be very very interesting, I’m optimistic about further share appreciation. As long as the majority holder does not decide to do something stupid (again). 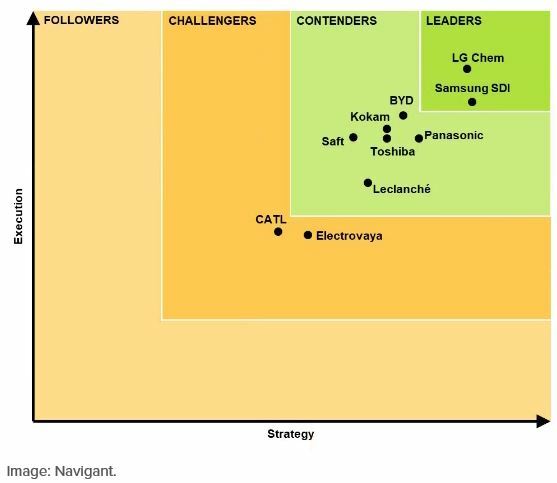 LG Chem which is my long long term holding for the EV-theme (being a leader in battery technology) has performed very well lately (although not as well as the pure-play Samsung SDI). Unfortunately the battery part of LG Chem is still fairly small. I expect it to grow substantially over the coming 5 years. I made a bet that XTEP, the Chinese shoe company was lagging it’s competitors who have all had great runs in the stock market and would do some catch-up after it’s semi-annual was released. It turned out being the opposite and I doubled up before the stock collapsed. I feel a bit beaten up, picking the only Chinese shoe company that is down performance wise. Still haven’t given up though, although less about my position than before. In my move to rotate away from China (Time to rotate away from China) I have sold a number of holdings lately. Two which I sold after very strong returns were YY and BYD. It has been a bit hard to see the shares continue to surge another 30-40% after I sold, but such is life. As I wrote at the time for YY, I got scared of the Chinese Gov clampdown on streaming services, but these things often go away and so it did. And the upside I saw very shortly after came true. Catena Media which I just bought into also had a negative event right after I bought. The CEO was fired with immediate effect. This gives me some worry that something might surface in the Q3 report. I have considering to reduce my initially fairly ballsy position. The only positive keeping me from doing it is the interim CEO which I have very high hopes about. I bought two bricks and mortar stocks, XXL and Tokmanni, I reversed my decision with a smaller loss for XXL and kept Tokmanni. So far I should have done the opposite, since XXL has rebounded nicely whereas Tokmanni is treading water. I want to start with a graph of EURUSD, because it has such profound effects on the market when it starts moving. With the risk of being called something of a Chartist, to me this is a significant move. We are breaking out of a 2 year side-way trend. This could be the beginning of the normalization of major currencies, where we see EURUSD moving back to it’s previous range 1.20-1.50 which lasted for about 10 years. What is a normal range though? It all depends on what time perspective you take. If we look at 30 years of data, we are today already very close to the average exchange rate. The 360 month moving average is at 1.21 and the 500 month moving average is where we are now, at 1.18. If EURUSD moved to for example 1.4 over the coming year, that would definitely have profound effect in the stock markets and on all ours portfolio returns. 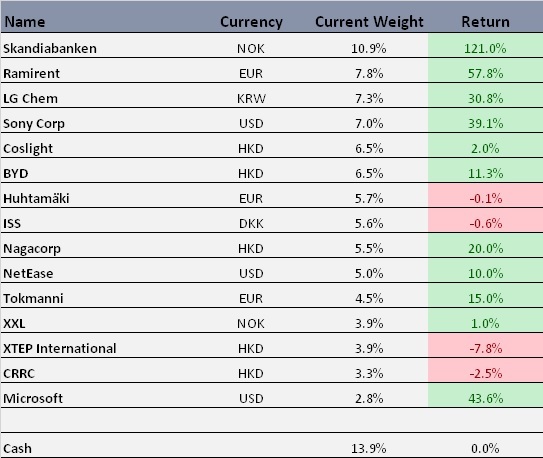 The kind of currency move we see now, leaves its mark on a Global portfolio and it’s returns. The effect is largest for domestic companies. For example if we take my largest holding Skandiabanken, which is a Nordic online retail bank, generating majority of it’s revenue from Norwegian Krona (NOK). Since all it’s costs and revenue is in NOK, its a purely domestic company. So when USDNOK moves, the portfolio experiences the full currency move, whereas the fundamentals for the company stays the same. 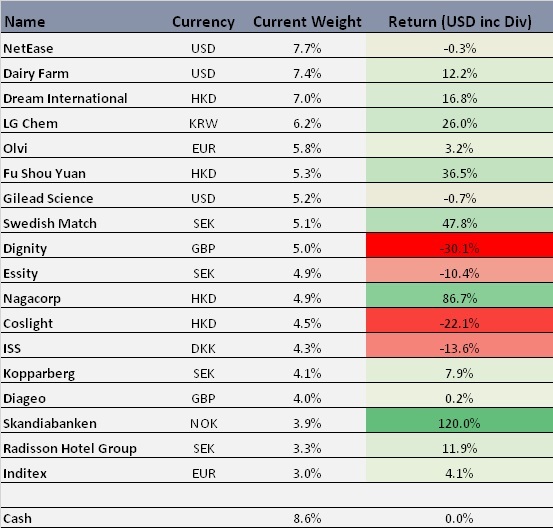 Since investing in Skandiabanken I have realized an extra 6% return from the NOK strengthening, pure luck! In comparison my holding in LG Chem, is traded in Korean Won (KRW). But the company exports all over the world meaning a lot of it’s revenue is priced in USD. So if KRW strengthen against USD, the company will earn less in KRW terms and the stock should fall. At the same time the KRW stock price is worth more in USD terms, so the effect negate each other. 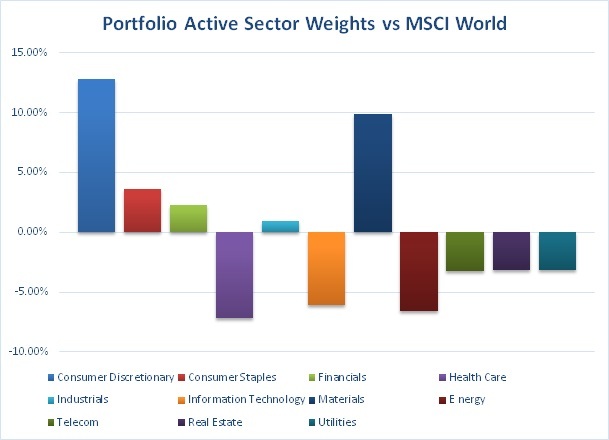 This means that companies that mostly sell domestically adds an extra component of FX-risk into the portfolio. 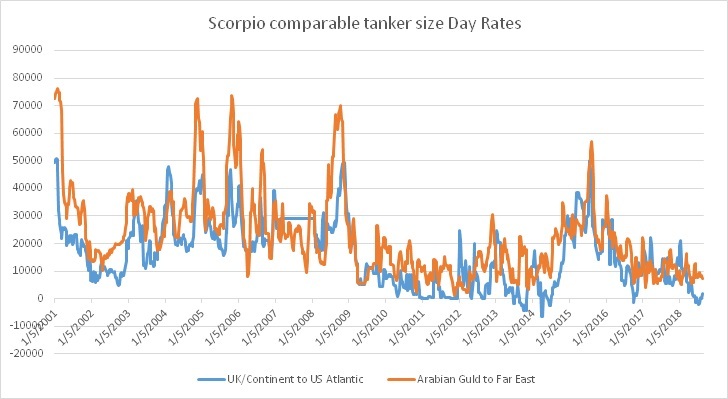 To make it even more complicated, the domestic company might have it’s cost in USD and chose to either hedge it or leave the currency risk open. 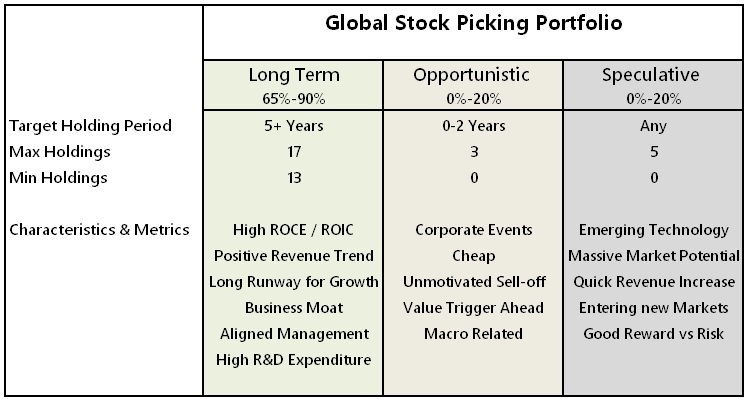 If you as an investor compare yourself to a benchmark, your definition of taking risk in this sense, is if you have another mixture of exporters vs domestic companies, per market, compared to the benchmark. This will make you over and underweight a number of currencies. 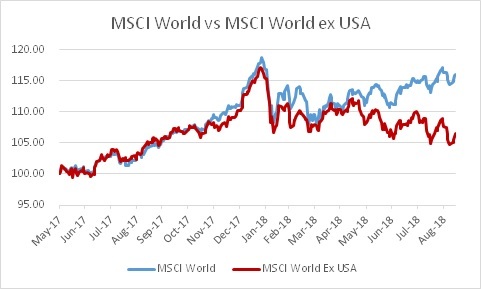 It all sounds very complex, but since weightings of for example MSCI World is so heavily tilted to the larger markets and large companies, in effect, you mainly have under/over exposures to a few major currencies (USD, EUR and JPY). The tricky part is that you won’t really notice this effect, before one of the major currencies really start moving, like now. So what’s the point of this analysis? 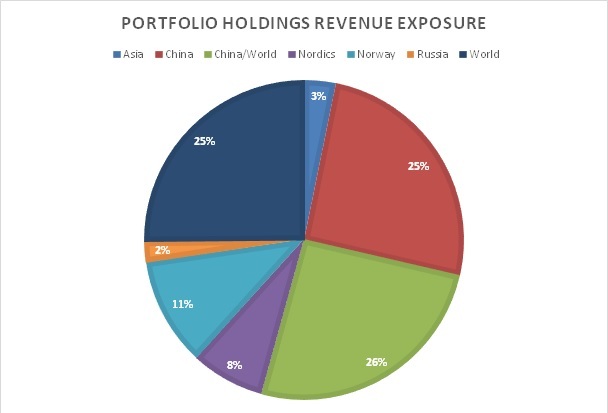 My point is that major benchmarks is made up of large companies with revenues worldwide, so the majority of your portfolio from a Global benchmark will be USD exposure. 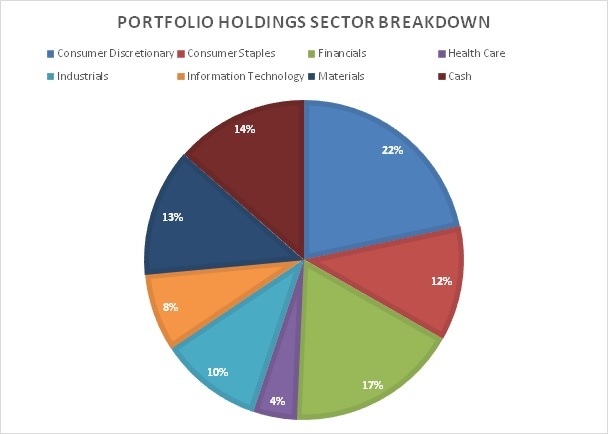 But if you as a stockpicker, find smaller domestic companies, which have their revenues and costs in a local currency (either naturally domestic or hedged to a domestic currency). You will have an implicit bet on that currency versus the USD. 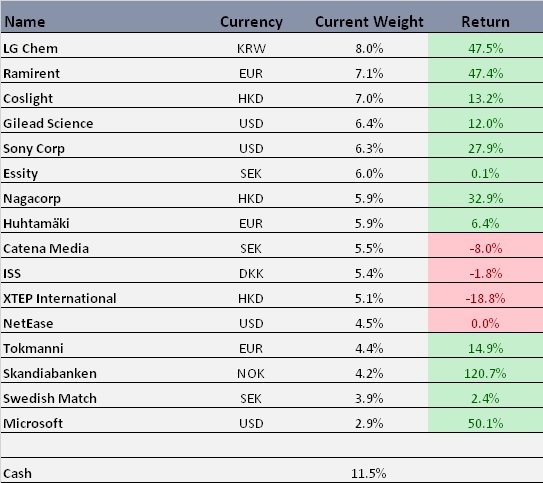 The reason why I bring it up, is because two of my holdings that have performed the best, is such holding, Skandiabanken and Ramirent. It’s nothing I lie sleepless at night about, just something to keep in the back of your head before you fill your portfolio with such holdings. 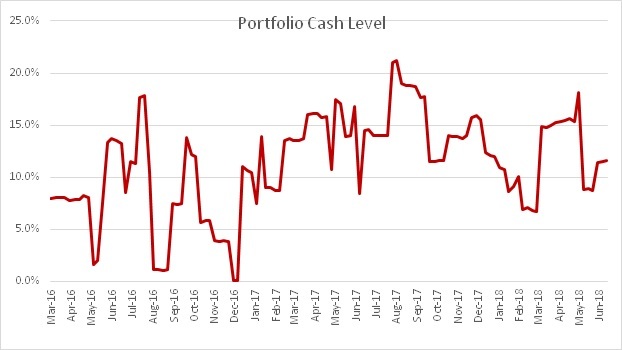 A quick look at the portfolio performance and composition shows continued strong performance, both for my holdings and the benchmarks. Especially Hang Seng is on a tear lately, somewhat frustrating when I already have come quite far in rotating away in my Chinese holdings (and the ones I have left have not really moved). For example my two previous large positions in Ping An Insurance and YY has in the month after I sold surged 15% and 33% respectively. Whereas the stocks I bought in Europe have trades more or less sideways (Tokmanni being the exception), I have also been somewhat saved by the weakening USD in these holdings. 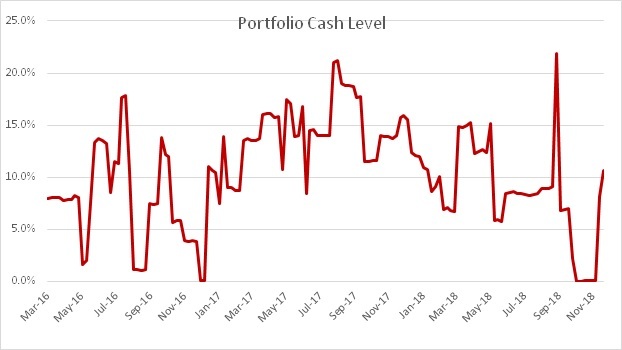 Cash level is still high, as always I’m spending a lot of timing searching the markets for something investable. And as always lately struggling to find anything worth buying. 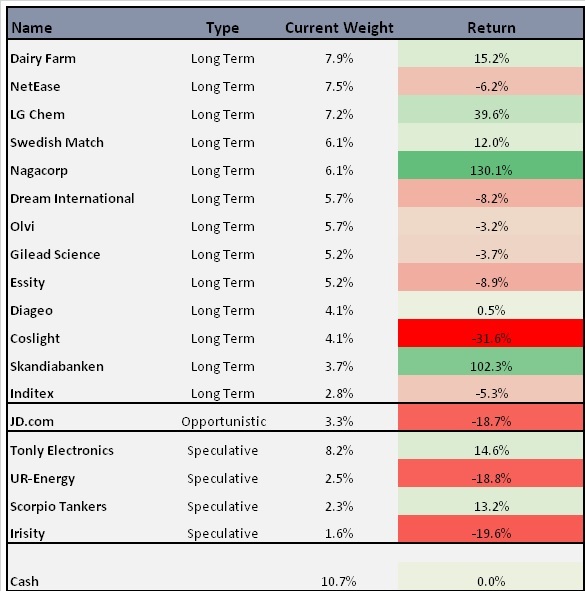 In my Portfolio page I have made my Watchlist a bit longer (in reality it is much longer than this) but maybe those stocks can give you some investment ideas. 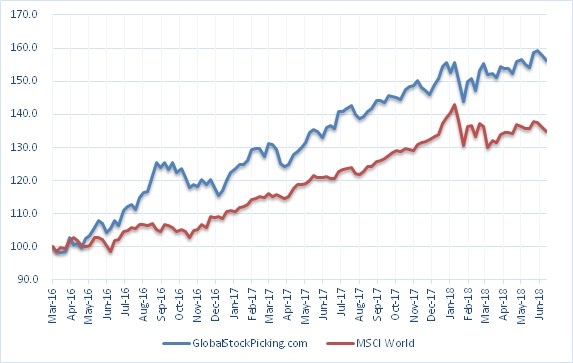 I will take one final slash sometime this year, to further reduce my China exposure (it will not go to zero as long as I find very interesting investment cases there). And according to my previous post about “where to hide”, I will try to move my portfolio one more step defensive (less cyclical) than it currently is.